Ciao amici! Our house tour continues with a walk through the kitchen and great room. As with so many families, this is the heart of the house, where we spend most of our time cooking, eating, relaxing, doing homework, or watching tv. If you missed Part One of the tour, HERE it is. I love unique lamps. This one of a pair that we made from a cast iron urn and copper piping which I fill with seasonal greens. We drilled right through the travertine counter tops so there are no unsightly wires. The plate rack was custom made in Italy, and the wine bottle candle hurricanes are part of my dad's collection. We recently upgraded our counter tops and backsplash to Brazilian Travertine. (Legacy Granite in Alpharetta did a great job, and I would highly recommend their services. If you go, please tell them I sent you!) The ancient microwave left the house to make way for the hood. It took a bit to get used to life without it, but I am so glad that big cancer box is GONE. The white planking behind the island is new, and the bar stools got cut to counter height with a new coat of paint and imperial trellis seats. We also installed a new marble farmhouse sink, bridge faucet and push button disposal (so cool!). The circa 1991 appliances and cabinetry stayed, but I don't mind them too much, as they blend in, still work, and the range is so old now, it almost has a cute vintage look. Open shelving for glassware was achieved by simply removing the cabinet doors and painting the interior. I also removed the lower doors and replaced them with a linen skirt. The terracotta relief from Impruneta depicts Bacco, the god of wine. It was a gift from my husband nearly twenty years ago. The large overhang of marble needed some visual support. I got these crusty beauties from Kemp Hickey's hanger. He also shows at Scott's in the North building. I purchased the white travertine sink from Floor and Decor in Roswell. The island base behind it was scouted in Florida eight years ago, and then we added the noce travertine top. This is where we do a lot of our kitchen prep work. The antique iron gate serves a functional purpose as well as an aesthetic one: to keep the doggie out of the dining room! Two large slipped sofas face each other with the Italian travartine coffee table in the middle. 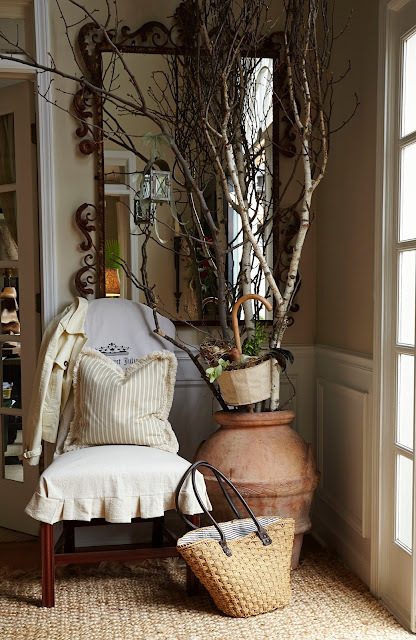 I added antique European shutters to the tall windows to give the space a little age and warm up the 20 ft.tall room. The round table is vintage, with a bleached top and green base. The lamp bases came from a church rummage sale. I picked up the Norwegian painting of the Oslo Harbour circa 1912 at an estate sale in our area. The window pane was a treasure found in an unused room of our farmhouse in Italy. The clock came from Ballard's Backroom right after we bought the house eight years ago. It set the tone for the rest of the room. Vintage objects from my antique booth. The guitar is antique Italian. It is purely decorative, but I loved the reference to Italy, and the fact that both kids play. Balinese puppet from our honeymoon. Lorenzo and I made this flower house above the mantle many years ago with wood we found laying around the property. When I started doing Scott's last year, he decided to make them again out of barn wood for sale in the Atlanta area. The vintage check chair was a recent Queen of Hearts find. I hope you enjoyed Part Two of our house tour! Stay tuned for Part Three. Thank you all so much for reading the blog. Your comments are so encouraging and truly make my day. People often ask me if I redecorate our home a lot. The answer is NEVER! Well, almost never... 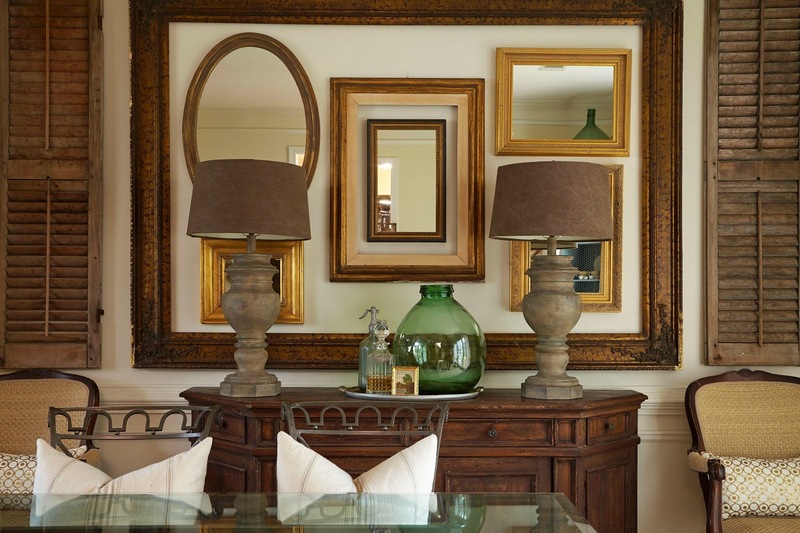 I love an eclectic, collected look, that comes from years of adding layers to create character and warmth. Although it's clear that I gravitate to neutrals, I also adore color, especially in pillows, art and accessories. It is a great way to add interest and change things up without breaking the bank! Most of the pieces in our home are either family heirlooms, or were bought when we first started out together in Italy. Others have been collected through my antique business, handmade, or even found in nature or on the side of the road! 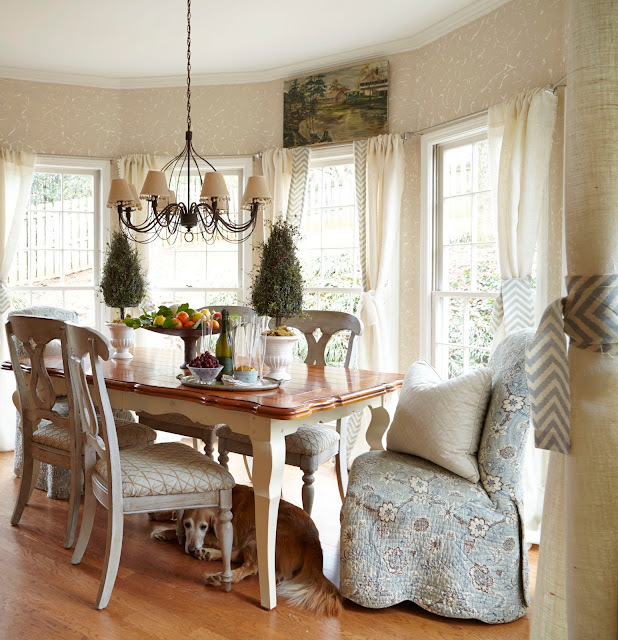 Truthfully, budget has always been an issue, but with a little imagination and a lot of elbow grease, you don't need a ton of money to have a stylish, warm and welcoming home. I hope you agree. Enjoy the tour! Our chandelier is actually an antique Romanian chicken coop. I painted the front door on a whim one day in my favorite color. 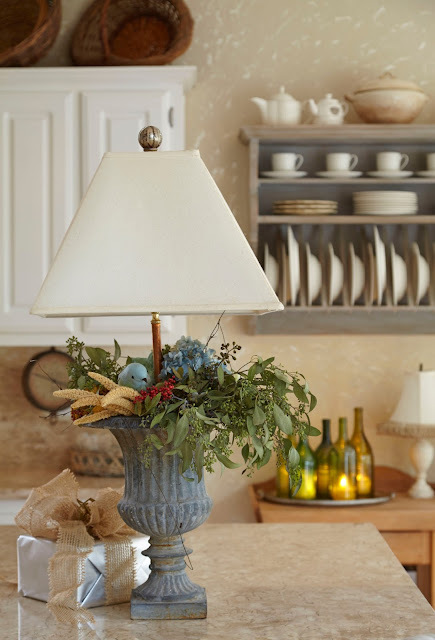 Custom urn lamp and gingham shade made in Italy. 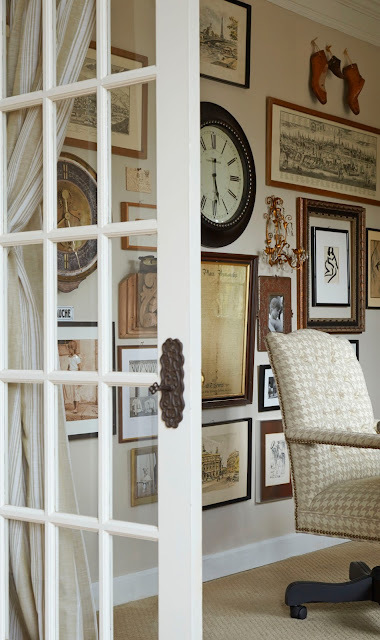 Three vintage prints hang in the empty frames of our Italian farmhouse window. The stairs are a DIY project painted in Urbane Bronze by Sherwin Williams with runners and stair rods by Target. This is truly a lifetime of collected art: from vintage maps of Venice (where my husband was born), and Florence (where he and the kids grew up), to sepia photos of the kids modelling my children's clothing line, to scenes of Paris (j'adore) and vintage shoe lasts from our days in the footwear industry. There's a bit of art by Rangoni and Dali', my grandmother's sconce, and clocks to keep time in the US and Italy. We've filled the wall, from floor to ceiling with meaningful objects. The tufted office chair was a Goodwill find for $8.00. I had it covered in ivory houndstooth and brass tacks for jazz. The old brass hardware got switched out with iron key latches from Hobby Lobby. Photo by Lauren Rubinstein. 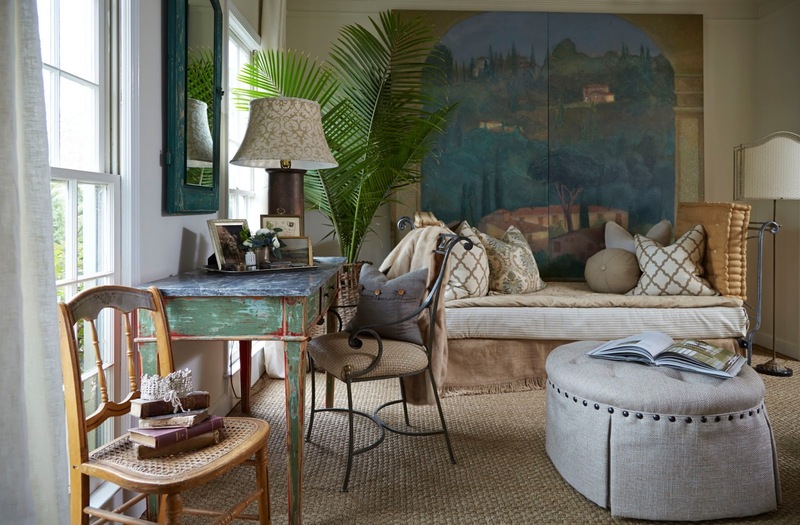 Wall to wall seagrass gives this room warmth and texture. The daybed was rescued from my girlfriend's mini-storage, while the desk was rescued from my neighbor's backyard in Italy. I looked at it sitting there for a few years, and then got the courage to ask if they wanted it, or not, since it was rotting in the rain. Sweet Graziella gave it to me, along with an armoire to match!! What do you know? Under the red paint was my favorite shade of green! But the piece de resistance is the massive mural; a wedding gift from my parents depicting the Tuscan landscape. The pouf is a recovered thrift store find. The iron chairs were bought as a set at a garage sale and recovered in woven jute. All pillows are custom, and the mink draped over the chair was my grandmother's. Photo by Lauren Rubinstein. Recovered chair from my parents. We bought the European pine armoire with wedding money, and the Balinese panels, turned screen, on our honeymoon. A custom frame maker was having a moving sale, and I scored BIG. This baby is old and chippy, and huge...and it only cost $50.00. He also made the smaller ones with mirrors already in them. The buffet and French chairs are from Lorenzo's family. The shutters and jar are from my booth. Lamps from Tuesday Morning. Here is the armoire/cupboard I told you about earlier. It used to be fire engine red, with corrugated glass panes. The demijon was found in the trash in Italy. 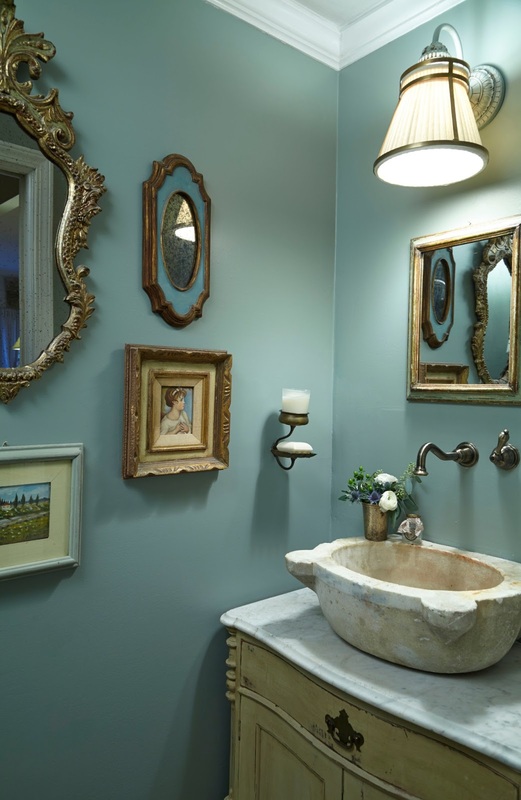 Antique lace crown on Aidan Gray sconce. This teensy room recently got a facelift. The Turkish basin sat in my garage for three years before biting the bullet to convert it to a sink. The marble topped chest also collected dust there for a few years. It is JUST the right size with little brass casters, and a new coat of Country Grey chalk paint and dark wax. The Venetian mirror is an antique from our Italian side of the family, while the rest are just things I collected along the way. I hope you enjoyed the tour. Your feedback is welcome and so much appreciated. It's not an easy decision to show your home to the world, but Lauren's photography was so beautiful that I wanted to share it. I will be doing two more posts to finish up this series over the next month, with little blogging in between. I am helping a friend/client with a big new house and we will be travelling for the better part of April. (Stay tuned for inspiring photos from Florida, Amsterdam, and Florence.) When it rains, it pours....and don't we know that well here in Atlanta!